In Africa, it can be found in almost any type of habitat from open rocky ground to scrubby brush and agricultural croplands. After a 65 day gestation period, the female gives birth to two or three kittens in a secluded den. The young suckle for approximately one month and then begin to accompany their mother on hunting trips when they are about 3 months old. After 6 months, the young are independent but littermates may still continue to travel together. 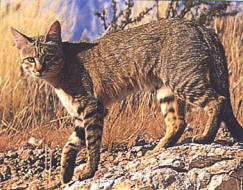 The African Wild Cat lives almost entirely on small mammals and insects. These cats are becoming increasingly rare in South Africa due to their ability to breed with domestic cats and from the associated diseases transmitted to these wild cats from their domestic cousins.